New iPad - same question - is it worth the upgrade? Well, depends who's asking. It seems the customers who gave Apple another record-breaking debut weekend had the answer already. For anyone coming from the original iPad, the latest Apple tablet is a great step forward. The situation with the iPad 2 isn't as straightforward but the screen alone is massive point in favor of upgrading. Of course, there's always room for nitpicking. The new Retina display does make a difference. The high resolution makes everything on the screen look smoother and more… natural. It's nothing short of impressive but we think they should've done something about outdoor performance too. A screen of such quality certainly deserved better. The camera has never been an important feature on a tablet, but Apple still decided to give the iPad users one of the best tablet cameras out there - a 5MP snapper with 1080p video recording with excellent quality both in stills and video. It's a huge upgrade over the iPad 2 and its 0.7MP still camera. The new iPad is even louder than the previous one and it boasts the same no-compromise audio quality. Of course, none of these upgrades will be possible without the new A5X chipset - the old dual-core ARM Cortex-A9 processor has a new GPU companion - a quad-core PowerVR SXG543MP4 graphics. The extra two GPU cores were a must to handle the resolution bump and the camera upgrade. But the A5X chipset comes with a nasty side effect - the new iPad can get really hot. And it would only get worse in the hot summer months. It's a thing to consider but not as big a deal-breaker as the death grip of the iPhone 4. For the heat to be really uncomfortable, the new iPad will have to be pushed to the limit. It's the price to pay for getting that gorgeous screen without sacrificing performance. So it's new graphics, new screen, new camera along with the same great user experience, the same top-notch audio quality and all that without a toll on battery life. There's of course, the LTE connectivity too, limited to the States only. In fact Apple claims this is the gadget to support the most GSM/CDMA/UMTS/LTE bands simultaneously. But there is a catch of course - to use the LTE connectivity you have to sign with a LTE-capable operator. The CDMA connectivity on the other hand, will only be unlocked if you activate the iPad with a CDMA carrier. So in good old Europe, you are left with a regular HSPA version only. The iOS running inside the new iPad is the latest 5.1 version. Unfortunately, it lacks the Siri assistant and some basic iOS functionality the iPhones have - Calculator, Clock app, etc. Surely, it brings a few free and paid native apps, but we still miss those basics. The iPad may have revived the tablet as a useful gadget, but it's far from lonely on the market as things stand right now. Samsung is making a push with its Galaxy Tab lineup. Even brands like Huawei and ZTE are teasing with quad-core tablets already. The 10-inch competitions is as tough as it gets - Samsung has three 10.1 tablets - the Galaxy Tab 10.1, the Galaxy Tab 2 10.1 and the Galaxy Note 10.1. All of them are running Android Ice Cream Sandwich and are based on dual-core chipsets. The most capable of them is the Galaxy Note 10.1 with a dual-core 1.4GHz processor and S-Pen support. It is so full of goodies that we couldn't possibly list them all here. It is yet to be released but is one of the tablets to look forward to this year. On the quad-core scene there are lots of gadgets coming in the next couple of months - the Acer Iconia Tabs A511 (with 1280 x 800 pixels 10-inch display) and A700 (with 1920 x 1200 pixels 10-inch display), the ZTE T98 and the Huawei Media Pad 10FHD. The last one is the most interesting of all with its 10" 1080p display and its quad-core 1.5GHz processor. It also packs 2GB of RAM and 8MP camera with 1080p video recording. It surely sounds like a tablet worth waiting for, at least on paper. The real threat today for the new iPad is, of course, the ASUS Transformer Prime. It is also a 10-incher and is based on the quad-core Tegra3 chipset. Other worthy features are the 8MP stills and 1080p videos, 32/64GB of storage, the HDMI port and the Android ICS ticking inside. The best part of the Transformers is you can get an additional keyboard dock - it includes a full laptop-like QWERTY keyboard, which comes complete with an extra battery, USB ports and an SD card reader. It's still something the iPad cannot quite match. To sum everything up - the third-gen iPad has a standard-setting screen, and is a solid upgrade in terms of connectivity and imaging. That's enough to justify an upgrade even from the iPad 2, but we are yet to see what the quad-core droids have to say in the next few months. Windows 8 tablets will be next. 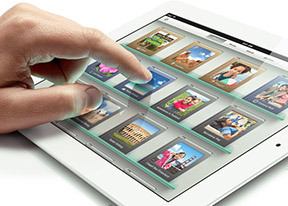 One thing we know we shouldn't expect from Apple is a next iPad. Yes, you guessed it right - it will be a new iPad. Something smaller and slimmer perhaps? Oh, well.